This month and next, we’ll be adding organic amendments to your lawnd and garden to boost spring health. Don’t let the date on the calendar fool you: Spring is already springing! While we may still get a few cold snaps, the ongoing mild temperatures have set your lawn and garden into motion a bit early this year. Trees are budding, roses are flushing and warm-season lawns will come out of dormancy earlier this year. That means you’re going to need to get ahead of your lawn and landscape when it comes to soil building treatments. 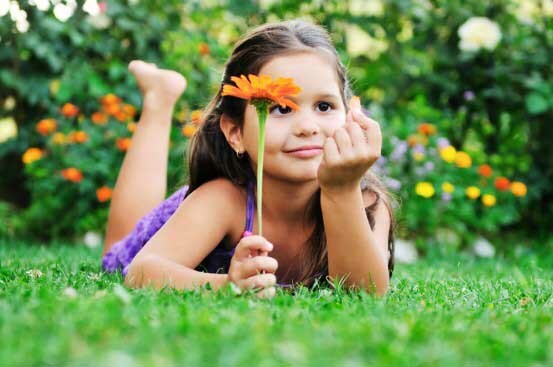 No worries about your kids and pets playing on the lawn when it’s healthy and organic! As part of our Soil Building program, we treat your lawn, landscape and soil eight times a year. Each treatment is targeted to be the most effective at its time of application. In February and March (treatment #2 on our service calendar) we treat the soil with our house-made, organic Liquid Compost Extract. It is the key element to reviving compacted, nutrient depleted soil. Increasing microbial activity in soil helps feed your lawn naturally. During treatment #2 we also add molasses, liquid seaweed and fulvic acid to the liquid compost extract in order to give a super boost to the microbes in the soil. Basically, we’re feeding the “good bugs” so they can feed your lawn. Beneficial microbes are essential for breaking down organic matter to provide nutrients to your lawn and landscape. When you switch to an organic lawn care program, consistency is key: Long-term results require a long-term commitment. Keeping soil healthy year-round requires that you feed it on a regular schedule. When you skip soil building treatments, you’ll have to expect reduced results.